I gently dumped out Drawers 29 and 30 since they have been sisters from the beginning—one was dedicated to lavender beads and the other to amethyst. Over the years, they became mixed into one big jumble; they needed sorting out. I laughed out loud when I saw 76 tubes of seed beads had taken over half of drawer 29! I guess lavender/purple was my favorite color for a long time! I reorganized them: putting some in other drawers, some in my Girl Scout donation box (I plan to donate them in 2018 and teach local Girl Scouts how to bead), until I ended up with only 26 tubes of seed beads taking up one-third of Drawer 29. As many seed beads as I had, I was dismayed at how little amethyst I had…until I remembered I had an overflow section in Drawer 47, so I reunited them. I found two strands of an amazing color of royal purple and set them aside for this week’s special necklace. The strands were labeled “African Amethyst” and I thought it was some vendor’s idea of “marketing b— s—“ as my beloved Donnie liked to call it. No. African Amethyst is a big deal! Due to its brilliant royal purple color, it is setting the standard for the most desirable grade of amethyst. It is completely in vogue and commands a 30% mark-up over regular light purple Brazilian stones or the deeper purple from elsewhere in the world. Dilemma: how can I love my darker amethyst now that I’ve met African Amethyst? Answer: I only own two strands of African Amethyst. So, the deeper and lighter shades are what I will live with. Based on what I paid for it, I purchased it before the rest of the world put African Amethyst in vogue. That is basically how I manage to keep my prices low—I base my retail price on what I paid for the beads, not what today’s value might be. 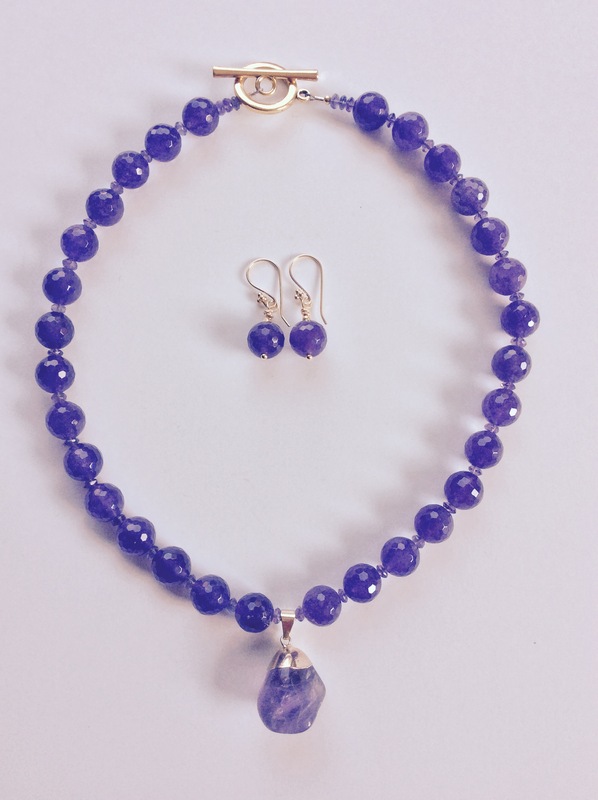 I strung these beads into a simple but elegant necklace with tiny faceted amethyst as spacers which allow the African gems to show off their sparkly facets. The center dangle is amethyst bezeled in gold-plate. The clasp is brass. Amethyst is the February birthstone. This necklace is 19” long and comes with matching earrings. $109. Allow me to postscript an amusing trivia I found: “Amethystos” is Greek for ‘not intoxicated’ due to their belief that drinking wine from an amethyst cup prevented drunkedness. Simply gorgeous my dear! Another thing we have in common – purple/lavender.